We wrote this several days before the Pa'a 'Eono race of 2012. The race went well, words and video from after the race are here. Two years ago the Pa'a 'Eono Hoe sparked a revolution in outrigger canoeing. By eliminating the archaic design restrictions, Pa'a single handedly changed paddling forever. With the freedom to design anything, builders like us jumped on the opportunity. Now, two years later there are a dozen open class canoes on the water in Hawai'i and multiple races allowing open class designs. Every paddling association in the world (other than Hawai'i) has now eliminated restrictions completely. We are proud to have played a small part in that revolution. The day that Pa'a announced the inaugural 'Eono we immediately began making plans to build a canoe. With just eight weeks to design and build it, we knew the odds were not in our favor. Strip planked one-off canoes are built completely differently than we build the Pueo on a daily basis. So not only were we tasked with coming up with a revolutionary design, but we also had to figure out how to build the thing. When we were three weeks in it became evident that, for once, we were right on schedule. Since being on schedule takes away the challenge (and because Keizo really wanted his own canoe to race) we (more like he) decided to build a second canoe. Now we were down to five weeks and had the added burden of trying to fit a second canoe in our shop while maintaining our current production schedule of one Pueo per day. If you were one of the unlucky few to have walked into our shop between April and May of 2010, then you probably had to wade through a pile of debris and hold your breath against the ever present cloud of fiberglass dust. To put it simply, it was a nightmare. The last forty-eight hours before the race is a big blur. We loaded two canoes with freshly sprayed gel coat on a 70ft barge on Friday night before the race. Due to massive seas, the boat didn't get to Moloka'i until Saturday afternoon and it took us three hours just to get the canoes off the barge. We then worked on the canoes until dark, then went back before dawn Sunday morning to continue the process. Half an hour before the race we were finally done. And then we won the race. And we won again the next year with a new canoe. Now, going into year three, things have changed. 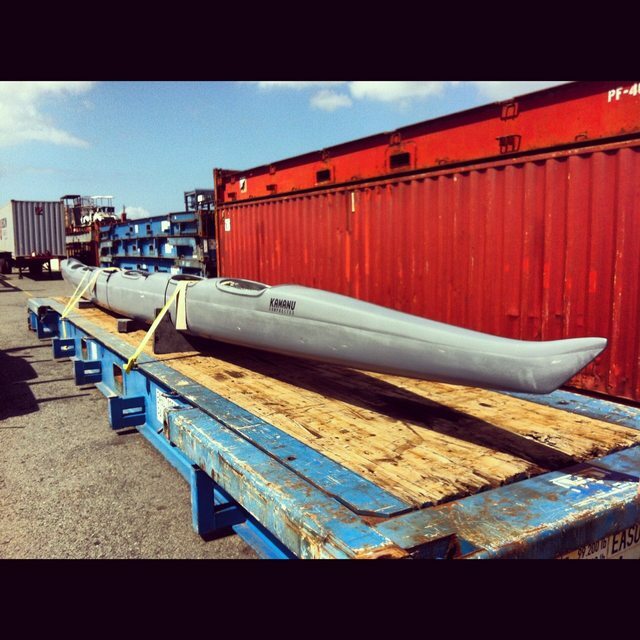 Our current canoe is the sum total of all that we have learned over our last five V-6 designs (Kawainui, Kapa'a, Ha'upu, NAC's V6, and Ka'apahu). More than that, we wanted it to embody Kamanu Composites. For starters, we put a manu hope on the canoe. Because open class canoes are strictly about performance, the manu is generally deemed unnecessary and has been removed. When we named our company after the manu on a canoe, we did it so that we would always remember where we came from. We wanted something that would keep us rooted in the tradition of Hawaiian outrigger canoeing and also something that represented leadership. Since the manu encompasses the canoe, leads the canoe, and is symbolic of the Hawaiian canoe, it was the perfect name for us. WIth our latest V-6, we knew it was time to bring it back. Equally as important is the crew that will be racing her. Justin Watts, Mael Carey, Alika Guillaume, Alex Epling, Makana Denton, and Luke Evslin. All of them are employees of Kamanu Composites. Justin does guts (laminating the internal structures of the Pueo and closing the mold); Mael made all of our seats between 2008 and 2010, was one of our original team riders, and is currently the Maui rep for Kamanu; Alika is a laminator (laminates the hull, deck, and ama of the Pueo on a daily basis); Alex and Makana are both finishers (rigging, finishing, quality control, repairs), and Luke is one of the founders of the company. Instead of putting together an all-star team consisting of our top team riders, this race was literally about family. For the first time ever, we will be racing not as Team Kamanu, but just as Kamanu. The members of this year's crew are a representative sample of the 'ohana that works hard to produce and deliver every Pueo. We aren't in this to win; we're racing 'Eono in Kamanu to represent where we came from, to show where we're going, and, most of all, to represent the hard work that each of our 19 employees puts into every canoe. Designed by Keizo Gates, led by Todd Strand, and built by all of Kamanu Composites, we are proud to present our newest canoe: Kamanu. Named after the manu, our company, and all that they represent, she is the embodiment of what we do. Kamanu, sprayed in primer gray (final spray job to be done later), will be blessed at 9:30 at Kaluakoi on Moloka'i just minutes before her inaugural voyage this Sunday. She is our ode to a new era. Words and video from after the race are here.